Everything you ever wanted to know about Nottingham, confidentially. In the week of the discovery of a Roman settlement along the A453 and the promotional launch of Jake Bugg's album comes Billy Ivory's spirited adaptation for the stage of former Clifton resident and Notts County midfielder David McVay's diaries 'Steak Diana Ross: Diary of a Football Nobody'. What distinguished 'SDR' from the glut of seventies football biographies and terrace reminiscences published a decade ago- apart from its contrast of an era when the protagonist's lot revolved less around Ferrari, Maserati and Gucci but Shipstones-soaked nights with Stubbsy, Braddy and Archie- was the eloquent access the author provided to his own teenage feelings and a vivid cast of characters set in a now-lost Nottingham. So how would this bawdy rights of passage already mooted for the screen translate first to the stage? Happily, from kick off- sorry, curtain up- the audience, many in club colours having arrived straight from a deflating afternoon at Meadow Lane (L 0-1 v Tranmere Rovers) discovered to their relief that their evening's entertainment was in safe hands. To the accompaniment of a throbbing seventies soundtrack and disarmingly near to the bone faux-commentary introduction from BBC Radio Nottingham's 'Uncle' Colin Slater, Perry Fitzpatrick's Dave McVay launched himself on stage addressing the audience like an Adidas clad version of Alan Silitoe's Arthur Seaton in 'Saturday Night and Sunday Morning'. 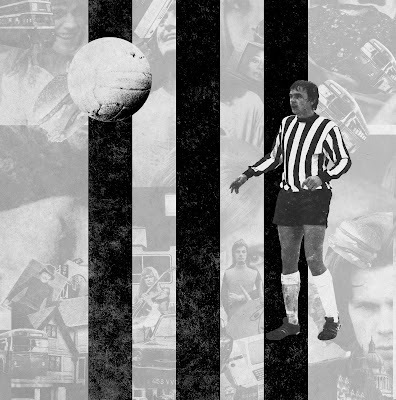 The pace was unrelenting as director Matt Aston translated with imagination both the iconic matches and extra curricular episodes of the diaries and if one or two of the characters in black and white became blurred in the more slapstick passages, Eric Richard provided a compelling reference point in an eerily accurate and brilliantly incomprehensible interpretation of gnomic Notts manager Jimmy Sirrell. Events took a more poignant turn as the helter skelter of the first act moved to a more measured reflection of off the field matters with Seamus O'Neill affecting as McVay's terminally ill granddad and if the conclusion that there's more to life than football was a little telegraphed, the combination of authentic Nottingham voices, dialogue and sentiment compensated. With a finale courtesy of the great Les Bradd and Ennio Morricone that was quite literally uplifting, the referee finally blew time prompting an enthusiastic response from a healthily large attendance. The word of mouth at Dave McVay's book signing earlier in the day at Notts County's Club Shop was already positive and, with the momentum of a good run, who knows, film location scouts at Crusader Island in Clifton might not seem so far-fetched after all. Welcome to Nottingham Confidential! A boutique blogazine for all your local news, views, reviews and interviews- confidentially, of course.